The midi you are listening to is a traditional tune called, 'The British Grenadiers'. Tower bridge, although it's not huge by modern bridge standards, still has to be one of the most impressive and best known bridges in the world. The bridge was designed with a double drawbridge opening allowing ships access to the London docklands upstream. 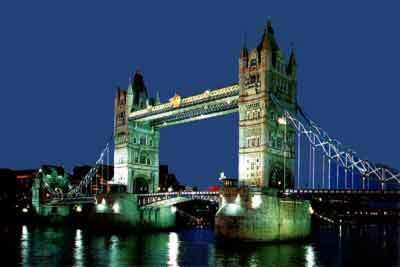 The name, 'Tower Bridge', comes, not from the two towers but, from the Tower of London, which is nearby. The bridge was completed in 1894 and provides an opening 250 feet (76 metres) wide. Its twin towers rise 200 feet (61 metres) above the Thames. Between the towers, stretch a pair of glass-covered walkways that are popular among tourists. The walkways were originally designed to allow pedestrians to cross even while the bridge was raised, but, they became hangouts for prostitutes and thieves and so were closed from 1909 to 1982. The Tower Bridge was operated by steam driven hydraulic pumps driven until 1976, when electric motors were put into operation. The steam power system is still kept in good repair, since it is open as a tourist attraction. Reduced shipping at the London Docklands, however, means that the leaves are now seldom raised.